Leading Kenya junior girls tennis player Angela Okutoyi is bracing herself for a showdown with other top players in the continent when the CAT 14 and under tournament serves off in Pretoria South Africa later this week. Kenya will only be represented by three players in the event that starts on March 25. Apart from Okutoyi, 13, other members of the team are Kael Shah and Derrick Ominde. Alicia Owegi who was the fourth member of the team will not travel due to exams. 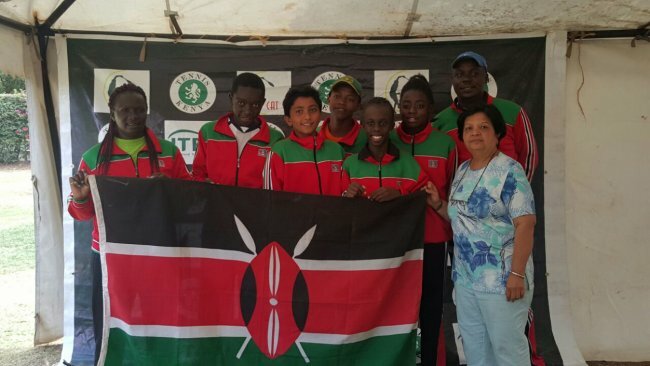 Okutoyi who won the Eastern African Junior team Championship in Nairobi in January said it would be an good chance to test herself against other top players in the continent in South Africa after having excelled in the region. "The tournament will bring together some of the top junior players in the continent and it will be a pretty cool experience playing against them," Okutoyi said. As part of their training, Okutoyi and Ominde have been training at Peponi School in the ITF East African Training Centre under ITF instructor Paul Dent. Okutoyi said by the virtue of making it in the national team for the continental showpiece, many young players will be motivated to take up the sport and that’s why she wants to work hard and at least get a medal. “I am looking at getting at least one medal. This will go a long way in motivating more girls into taking up the game. Because my success and that of my teammates will make them believe that they can also do it,” she said. Ominde too is feeling confident ahead of his maiden continental show, which he claims it could be tough. “I don’t expect it to be easy. All the players that will be there are coming from various qualifying events. So they are all coming to put up a good show. I am confident of putting up a good show,” Ominde said. The team is being coached by Caroline Oduor and Peter Rakuom.